The scheme proposed that an extension be built to accommodate the new kitchen/dining area which incorporated the stone walls of a previous outhouse. 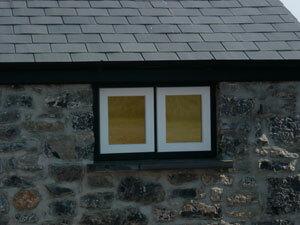 Slate flooring was saved and reused and oak lintels were replaced in kind. The roof structure was replaced to match the existing and reclad in slate. The barn had lain derelict for many years and was gradually giving in to the onslaught from the brambles that had overtaken it. Our clients were sensitive to the situation and keen to see the building brought back to life and re-instated for future generations. The building now has a new life and vibrancy reflecting its past use. We suggest a call first. Come and see us at Bank House. We are in the middle of the High Street in Narberth, Pembrokeshire. Parking is available in the Townsmoor Car park at the top of the High Street. We are 3 minutes down the High Street on the right hand side, on the first floor, above Bubble and the NatWest Bank.